Each November a dusty throng of camels and their owners, pious Hindu pilgrims, holy men in their hundreds and spectators from far and wide descends on this normally somnolent desert outpost. Beyond the fairground the Rajasthani nomads make camp with their camels, flanks freshly branded, and tricked out with the finest pom-poms and flower-bedecked harness. Tourists doze fitfully in the pre-dawn darkness as throngs of chanting pilgrims circumnavigate the sacred tank or lake. As the day wears on, the faithful gather to disrobe and bathe in the hallowed waters. Narrow, winding streets fill as sadhus, streaked in ash and garlanded with marigolds, brush past beggars and backpackers; sandwich boards hawk internet access and Israeli fast food. 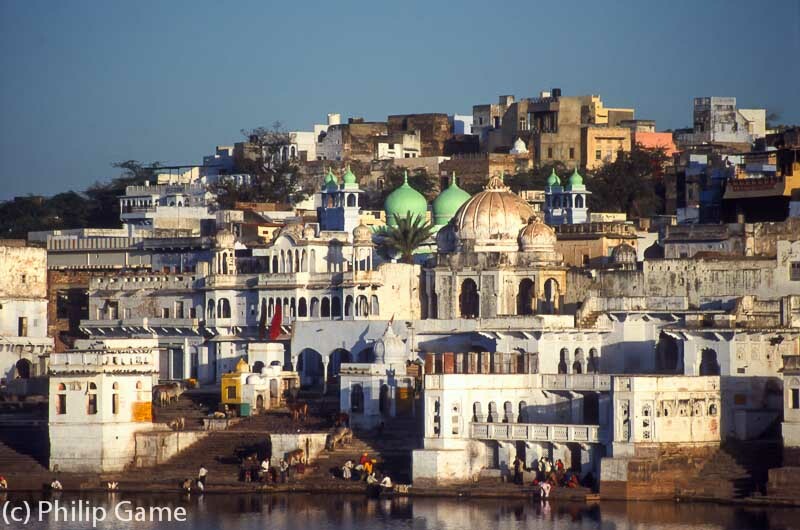 A superb gallery on pushkar ! V.
Lovely Pushkar gallery. Great portraits. I like the gallery, specially those portrait.